Recessed panels for inlaid tile accents, 3 piece corner unit with 8" smooth tile finish, built in caddy, beveled 3/4" threshold and center drain. Bestbath’s Designer Series multi-piece showers offer custom molded recesses on the side and/or back walls. These panels can be filled with a limitless array of decorative styles, such as colorful glass or ceramic, providing a custom design that lets you carry backsplash tile work onto your shower walls and/or floor. Download ORDER FORM to be completed with order. Multi-piece units feature a patented interlocking system technology for smooth installation and a tight seal, preventing leaks or water damage. Bestbath® Designer Series three piece 42" x 42" neo-angled barrier free shower provides walk-in or roll-in access for seniors or persons with disabilities, enhanced by custom recessed panels for inlaid tile accents. Strong, luxurious polyester gelcoat composite fiberglass shower features an "Eight Inch" tile look finish, built-in shower caddy, beveled 3/4" threshold, and center drain. Full plywood backing on all walls provides outstanding strength and customized installation of accessories. The self-supporting pre-leveled bottom eliminates mud setting. Easy, snap-in-place installation from the front. No grout cleaning and easy care finish. No tiles to fall off. Luxurious gelcoat finish also available in custom colors or with custom accent tiles. 30 year limited warranty. Manufactured in America. 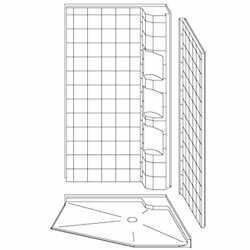 W x D x H (Outside Dimensions): 42" x 42" x 77 -3/4"
LEAD TIMES: NEED IT NOW Packages (WHITE Shower Unit with the Complete Fixture Package) ship within 24 business hours of order processing. White, Biscuit, Almond, Bone and Ice Grey Units ship within 3 business days of order processing. Add 1-3 business days for recessed inlays. Please call for lead time on multiple units. This item is delivered via Freight. Additional freight fees may apply based on delivery arrangement needs.